As I write this week’s Sepia Saturday post focusing on ships, I think of the various vessels that brought my ancestors to the shores of the United States. I ponder these journeys while eating a saffron bun, a treasured treat of my Cornish heritage. As a child I grew with these dishes that were remnants and reminders of the long ship journey from the homeland: pasties, saffron buns, Cousin Jack cookies, Sunday roasts, goodies that remind me of how thankful I am that despite my ancestors’ long ocean voyage from the rolling hills of Cornwall to the frigid shores of Lake Superior, those recipes were treasured as mementos of the home they left and were passed to us today. I have been on a journey of a different sort. And while not a journey on a ship, my journey has spanned time and place as I unearth the lives of the families, mostly miners, of my past. I began with my mother’s side of the family tree for she is alive and valuable memories can be coaxed from her. The tales of my journey into her family tree are told elsewhere on this blog. It is a journey full of mouse clicks, Internet discoveries, travels to my home in Marquette, Michigan, to Ely, Vermont, and the best journey, a trip across the ocean to stand in the little villages my great grandparents and beyond called home. The St. Ive Parish Church. The village of St. Ive, not to be confused with the seaside town of St. Ives, had a population of 468 people in 1801. In 2001, 2121called St. Ive home. 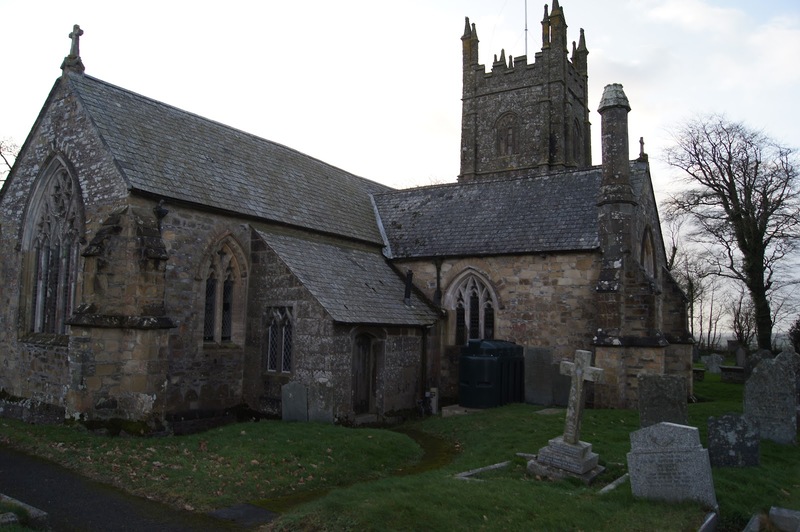 The photo above is of the parish church in a small Cornish village, St. Ive, where one branch of my mother’s family lived. The opportunity to visit this roadside village and walk among the markers took me back to the time when Jane Ruse Hill and daughters must have journeyed from their home to Sunday service. I felt their presence among the grave markers and in the rustle of the bushes. Lately, I have let my mother’s genealogy rest a bit while I travel back through the generations of my dad’s side of the family. Imagine my surprise when this same small village cropped up in the census, baptismal, marriage, and death records of the Doneys and Slades, names from his branch of our one family tree. What karmic destiny that centuries later and an ocean away, the descendants of two families who inhabited this same tiny Cornish village would meet and marry! Now I plan to journey across that ocean again, to once more walk the churchyard of St. Ive, this time to think about those ancestors on both sides of my family tree who packed up their lives and memories, stepped onto a ship, crossed the vast ocean so that their descendants could once again join together in the Upper Peninsula of Michigan. It is a strange and wonderful journey we share. Great story, Kathy! Makes us all realize how small this huge world really is! A marvellous coincidence. Or was it? Some things are just meant to happen. It was definitely fate! What better excuse than to visit the wonderful county of Cornwall and enjoy a local saffron bun. Some day I hope to fit together enough pieces to find my connections to Cornwall. I always heard that my great-grandparents were from Cornwall, but I've found that not to be true as they were mostly born in Durham. So I'm thinking it was the generation before who may have moved from Cornwall to Durham to follow work in the mines. Anyway - I'm always intrigued by pictures of Cornwall. You are so right, it is a strange and wonderful journey that we all share. Thank you, I enjoyed your story for Sepia Saturday! Slade! Amazing! That's my maiden name. My Slade research is going nowhere fast. Your Slades didn't wander into Georgia or Florida, by chance, did they?? I love that you have old recipes that reflect your Cornish heritage. one that doesn't involve seasickness. It is fascinating to think of our ancestors and the ships they sailed on to reach the US. My paternal ancestors came in the 1920s. My maternal much more than a century before that. The difference between these people and what it was like for their crossing of the Atlantic is astounding.